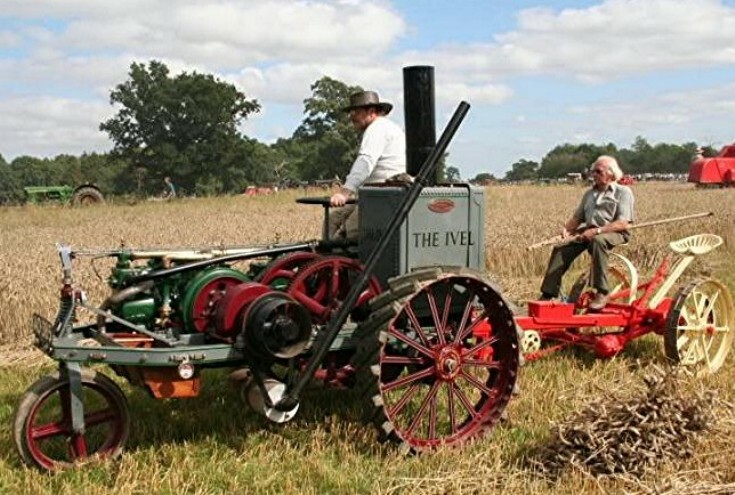 The Ivel Agricultural Motor was light, powerful and compact. It had one front wheel, with solid rubber tyre, and two large rear wheels like a modern tractor. The engine used water-cooling, by evaporation. It had one forward and one reverse gear. A pulley wheel on the left hand side allowed it to be used as a stationary engine, driving a wide range of agricultural machinery. The 1903 sale price was £300. Daniel Albone (12 September 1860 – 30 October 1906) was an English inventor, manufacturer and cyclist. He invented the world's first successful light farm tractor, and the Ivel Safety bicycle. Albone conceived a light weight petrol powered general purpose agricultural vehicle. By November 1901 he had completed his tractor design, and filed for a patent on 15 February 1902. On 12 December 1902 he formed Ivel Agricultural Motors Limited. The other directors were Selwyn Edge, Charles Jarrott, John Hewitt and Lord Willoughby. He called his machine the Ivel Agricultural Motor, the word 'tractor' did not come into common use until later. I think Dan albone was my great, great grandfather.